Humanscale 4G offers simple, dial-a-tilt adjustability and intuitive height adjustment in a sleek package. It is also very popular. with simple dial-a-tilt keyboard angle adjustability. 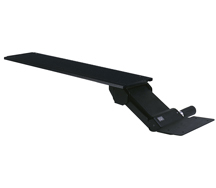 Standard Track Length 21 3/4"
Alternate Track Lengths 16” and 18"
All keyboard platforms need adjustable arm installed under the desktop or table. 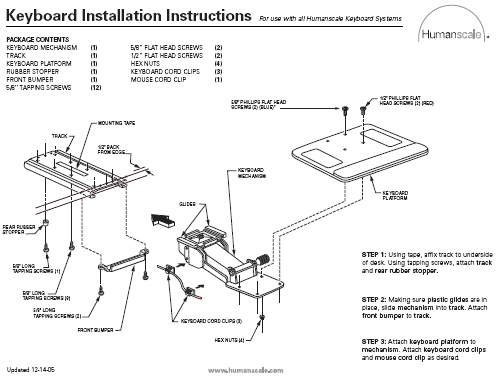 In order to install adjustable arm with standard track, the desk or table must be at least 22." deep. The undersurface must be flat and free of drawers, structural supports and other obstructions. A 22" track will be directly mounted to the underside of the desk or table with ten 3/4" screws, so the undersurface must be able to accept wood screws. You might install a shorter track (18" or 16" ) If your desk is less than 22" deep. In that case your keyboard tray might not retrieve all the way under the desktop. An arm with shorter track (18" or 16") is capable of handling all ergonomic functions such as bringing the keyboard tray up or down, in and out, swivel to left and right and provide negative tilt. Please call 650-654-4300 or 888-456-ERGO (3746) and ask a technician to explain the details of the products for you.